I can see the counting being annoying for some, but at least its price won't fluctuate wildly from turn to turn like Philosopher's Stone given that it counts all cards and not just the cards in your deck and discard pile. Wouldn't at all be hard or unreasonable to keep track of your total card count with a piece of paper. Yeah and you don't have to count each turn. If you counted e.g. 32 you can play for some turns and don't have to count again unless you are sure that you are around 40. First, the conversation at hand. I think Craftsmen should work, and be very interesting. Wording suggestion: 'without revealing face-down cards.' On an unrelated note, I think that Sanctuary would be a great candidate to be a Project, since (the way I'm reading it) only one is useful to you. Edit: Also, some of your card names match Renaissance names, namely Border Guard and Old Witch. Edit: Nevermind, didn't read Monk hard enough! Yeah, I guess I'm still in denial about this. I've been dabbling in Dominion fan-cards for many years now and not one name overlap until now. What a run! Maybe I should be excited to finally have some official cards with names I've been using. These two (Old Witch and Border Guard) will be especially tough to rename as their play instructions are intrinsically tied to their names. Ugh! Now I know how Asper felt when he had to rename Werewolf. The card used Silvers to block the Attack! That can't possible get more Werewolfy! That's a rough one. Well, I should get going on these. Any name suggestions? Old Hag, maybe? or just Hag? Maybe Border Patrol, if we can have Village and Border Village (and Fishing Village, etc). Here is a stupid idea to change Grand Witch: make the 6VP conditional on the card not being in play. Thus it get buffed when you want to use it constructively, i.e. as the double Groundskeeper, but using it as junk that you can spread via Mountain Hag is still a thing. Consulate looks good, neatly avoids Possession abuse. For Old Witch, the cantrip thing makes it feel similar to Familiar on first glance, so maybe something like Raven? Or Warlock, if you want it to be a Witch variant. Head Witch? Blind Witch? Mountain Hag? Witch Council? Name Changes - I appreciate all the name suggestions. I was never in love with Border Guard as a card so I'm just going to remove it. Renaming Old Witch to Old Hag was tempting, but I feel the Hag cards are generally Cursers that don't provide draw. I've been sitting on a good image for a Warlock card so I think I'm going to just go with that! Grand Witch - Holunder9, this is an interesting idea. I'll consider it if I ever need to buff Grand Witch, but in all my testing the line as a whole has more than made up for the -6 VP deficit you incur. I certainly don't like that it shrinks the window in which you can hit your opponents for the full -6VP. Maybe that's a good thing. I haven't had a lot of chances to test this aspect of the line, but I tried to make it as hard as possible to set this up. Messing around with some fun ideas. Haven't done much to refine the values yet, but I think it has potential. What's the most broken card combination you can think of? If we take the most obvious one, Village and Smithy, the net effect is +1 Action and +3 Cards for you, +1 Card for them. Compare this to Governor which is +2 Cards for you, +1 Card for them and it already looks pretty broken. The net effect of Council Room and Urchin is +4 cards for you, some sifting (with handsize remaining equal) for them. So I think it is clearly too strong. There are also probably some rule issues with Durations, Reserves and one-shots (what happens when Prince or Hireling are on the mat?). I plan to tweak the values, but as it stands, Smithy+Village give you +3 Cards, +1 Action and each other player gets +2 Cards ($7 total rounded up gives +2 Cards). Sorry, I misread it as round down. This is of course OK. Like Governor or Council Room probably pretty strong with handsize attacks but this isn't the end of the world. -Durations and cards that move themselves (to the trash or Supply pile, etc) no longer work with Sigil. -Now other players draw a card per $4 coin the cards on your Sigil mat cost total. I don't see many good points about Sigil to be honest. One either puts a great deal of thought into it at the start or puts an automatic combo on there. For the latter, I thought of Secret Chamber - Poor House; instant Province without any giveaway draw (or is it one card?). Either way, the player psychology would lean toward focusing on sigils every time, which makes for super fast games like with governor. Army calls for build-up, this doesn't. Or the first player will always win by getting Ghost Ship. Foiled by a card that isn't even in the game anymore! 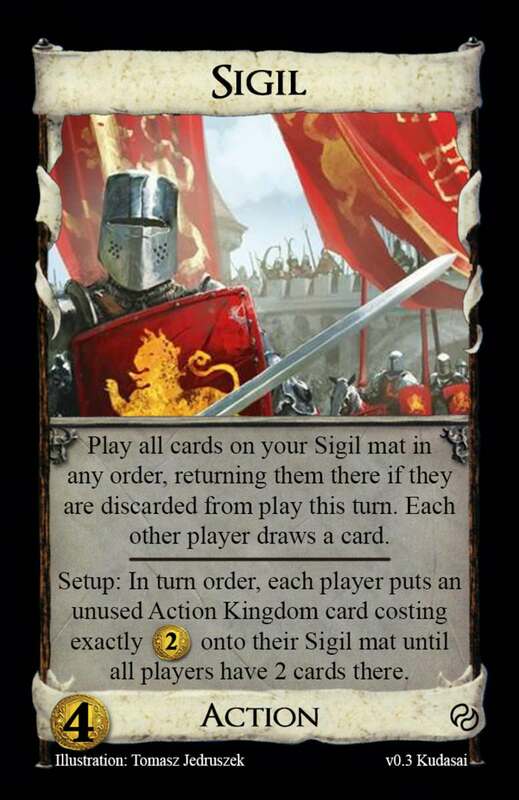 I'm not going to worry about Secret Chamber as I don't ever use the removed cards, but Poor House and Attacks directly counter how I had hoped Sigil would play, so I've removed the possibly of having both on the Sigil mat. I certainly think Army is the best and most fair way to execute the merging of cards, but I wanted to take it a step further and allow players to forge cards from most of the cards available. So really this is more to have fun than anything. A quick clarification: Players can choose cards other players have already chosen as long as they are not in the Supply. They can even choose the same card twice for their Sigil mat. This initially seemed wonky to me, but it removes any huge disadvantages players 2 and more would have. Ghost Ship wouldn't even work well with this (unless the other action you chose costs less than $3) because you make then put 2 cards back and then make them draw 2 cards. Anyway, if my opponent chooses Ghost Ship, I'd choose Cursed village. Cursed village + storeroom would be really strong here anyway. This card looks both fun and possibly broken. Definitely worth trying out. Restricting the cards to cost $2, unused Actions vastly reduces the available combinations, but it should streamline the setup process while still allowing some fun combinations that cater to many different play styles. This will also help eliminate a lot of broken combinations outside of the $2 cost range. Although there are likely still going to be some issues. *Ahem* Beggar x2, Lurker x2. There are 31 $2 Kingdom Action cards among 314 Kingdom cards totally. So Chances that 0, 1, or more $2 Actions are in the Kingdom are 0,348 0,3937 and 0,2583. 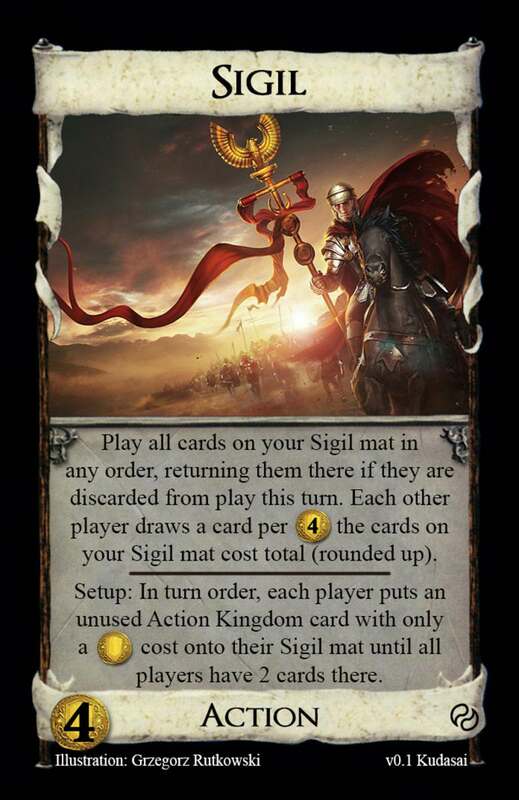 In a third of all Kingdoms Sigil does nothing, in a fourth of all Kingdoms you have a choice among 2 cards and in around 40% of all Kingdoms you have to take 2 copies of the same card. So while this new version made the card much more balanced it came at the cost of providing no or just very limited choices. While it would be slighty wacky Sigil could perhaps get away with also playing Treasure and Night cards: Treasures work anyway, Guardian works and Monastery will never be taken (unless there is stuff like Cobbler or Transmogrify). By unused, he means not in this kingdom, which means there will be 31 choices minus the number of $2 actions in the kingdom. I still like the broken version better personally. Just include a veto option. My mistake. I like this even less than, no way I would want my fellow players to read 30 cards and then come up with a decision, no way I would want to spend 10 minutes for setup and then everybody has the same Sigil with Pawn and Raze anyway because there is no trasher and extra Buy in the Kingdom. Might be good to do it Black market style. Let people choose from a (semi-)random selection of 20 cards that aren't in the kingdom. That way you could do without the $2 cost limitation and still easily exclude completely broken stuff. You could also du it Duid style, assign 3/4 $2s to the Sigil mat and players can choose 2 out of 3/4 whenever they play Sigil. The disadvantage is that this totally eliminates the pre-game choice/ drafting. Seems more interesting to play a game and then being able afterwards to tell a story about why Alice won due to her smart Sigil drafting choices. Interesting idea, but there are a lot of $2 cost cards that have repetitive on-play effects. This is an extreme example, but you could end up with Moat, Lackeys and Courtyard which are all about the same. You also could end up with cards that do not discard themselves the turn they were played, which would defeat a lot of the purpose of Sigil. I'll have to think on the $2 cost restriction. It's true that Black Market calls for all unused Actions to be in the Black Market pile, but players tend to choose the cards in there. Even the online version restricts the number used. So I guess the same logic could apply to Sigil. Give a broad stroke setup and let players figure out what works for them in terms of selectable cards. Maybe using $3's would make it more interesting, as there's a lot more variety among them than $2's, mostly due to number available. It would probably need to cost a good bit more then, though. Maybe each player could get one $2 and one $3? That would get pretty wordy, I would think. Anyway, I really like the concept, and think it's actually more interesting using lower-cost cards rather than $4+. Pawn/Duchess has a lot of great synergy. Play Duchess, reveal the top card of your deck, if it's a Treasure you can then play Pawn and skip the unneeded +1 Action. Pawn/Tracker seems like it would add a lot of utility. Pawn/Courtyard allows topdecking of non-Action cards to be drawn by Pawn. Giving your opponents +1 Card per play of Bannerman is pretty harsh (maybe too harsh) so you certainly want to measure how many Bannerman you player per turn. Choosing a combination of Pawn and some other card that wants to be spammed may not even be a great strategy. I certainly will try some Pawn combos if I can ever get around to playtesting this.